Fire and In laws, it’s Momily Monday. It’s round two of Momily Monday! Find this week’s Gospel here. 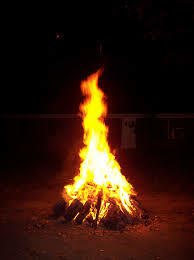 The enthusiasm of its fevering flames mesmerize and captivate while its fervor and power repel the gazers from recklessness or out of order behavior, reminding us that if there are any two things that ought to be respected it’s a burning fire and probably also the woman who raised your spouse. The thought of Jesus using such a powerful force to fulfill his mission is thought provoking. On Valentine’s Day three years ago, my parents house caught on fire with all of us home, and if there is anything that I learned that day its that a route towards safety is something for which to be thankful and to cling. Additionally, Valentine’s Day is the worst. Fire gets us moving in the right direction, quickly, and with intention. Or else, it absorbs and mercilessly destroys leaving little evidence of what originally existed. To me, this imagery is how I understand the tension between the Peace vs. Division to which Jesus refers in this week’s Gospel. Peace implies a sort of motionlessness, and maybe even complacency. Fire, however, gets the behind bouncing, causing division by necessity, for the reality is sort of simple: run towards safety of the truth, or get burned. As a mother of three, with a household of five, division is something to which I relate. The transition from man to man defense (parenting two kids) to zone defense (three children), is one in which my husband and I sometimes end up punting, often with zero points on the board, and if there is anything that leaves my love for God and family sizzled and burnt out, its that. Yet it’s the struggles and division that often show us where our weaknesses are, and how much we need God to be #1 MVP, or else, we too will be left consumed by something other than the fiery love of our creator. It’s also in the dividing times that we yearn for a clearer direction, which hopefully draws us closer to the Big Man. So this week, may the love of God fuel our family life and mesmerize our hearts, scorching out the bad, and igniting the ambivalence. And, when I burn dinner, I’ll consider it living the Gospel. “And, when I burn dinner, I’ll consider it living the Gospel.”– SO Funny! As I was passing the 2 year old and the 1 year old back and forth with my husband at Mass, I caught just a little bit of the homily. Our pastor talked about how, in Jesus’ time, having a family could mean the difference between life and death. Especially in a time with no hospitals or nursing homes. However, I missed the oh-so-critical part where he tied that in to the Gospel. This reading also reminded me of a dear friend of mine who nearly lost her family when she joined the church.